Doctoral Studies in Osmania Medical College,Hyderabad in 1998, the speciality being Gastroenterology. Extensive expertise in performing various Diagnostic Endoscopy and Colonoscopy, Esophageal Variceal band ligation. Oesophageal stricture dilatations(Balloon / Savary Gilliard,Endoscpic haemostasis for Bleeding ulcers, Polypectomies, ERCP, EUS and various metal stent placements. 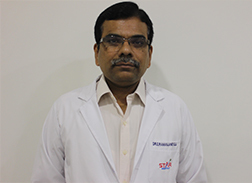 Has special interest, focussed approach and vast experience in managing various liver disease including Acute Liver care. Lifetime membership of Society of Gastrointestinal Endoscopy on India (SGEI). Conducted clinical trials and published papers in National and International journals.